Find out why everyone likes peanut butter cheesecake with Easy Peanut Butter Cheesecake. This peanut butter cheesecake is even ready in just 15 minutes! 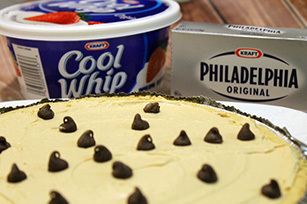 MIX whipped topping and cream cheese together until blended well. ADD sugar and peanut butter until completely mixed. FILL pie crust and top with chocolate morsels. For firmer pie refrigerate 30 minutes before serving.